Pretty card, the yellow looks gorgeous! Thanks for joining our link party over at Craftin Desert Diva’s! Fabulous Design….thank you for your valued support in entering our challenge, without you we would have no challenge. 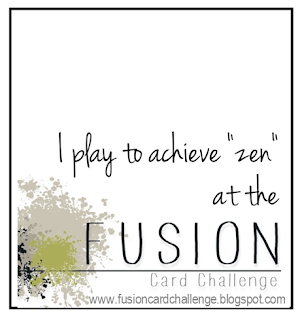 Good Luck in the draw…..and I do hope you will join us again next week…for another fab challenge…. Very pretty card! The bright yellow reminds me of the sunshine I hope will find it’s way to the midwest. It’s been cloudy and gray here. Love your sweet card! Thanks for joining us at Seize the Birthday! Wow, such a bright cheery card…I think many are hoping to see some bright blue skies and yellow sun shining down on them! this card certainly brings some cheer! thank you for linking it up to Seize the Birthday! Your hand made paper looks lovely and is perfect teamed with the Darice polka dots EF. I love the zingy yellow shade. I like your faux bow too. Now that’s my kinda bow. Simples but oh so effective and thanks for the tip. Thank you for fluttering by #4. 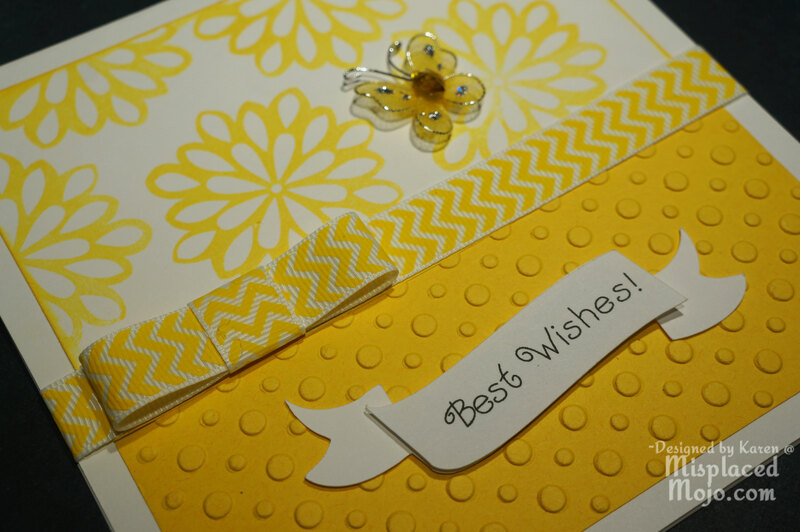 Wonderful card, love the yellow, it is always a happy colour, thanks for joining us at Fan-tastic Tuesday this week. So beautiful!! LOVE LOVE LOVE!! Nice, bright and sooo cheery! 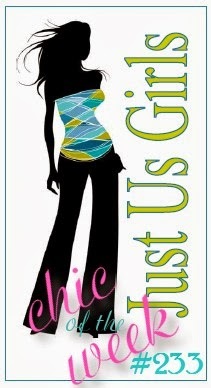 Perfect for our spring theme!! Love the added butterfly!! 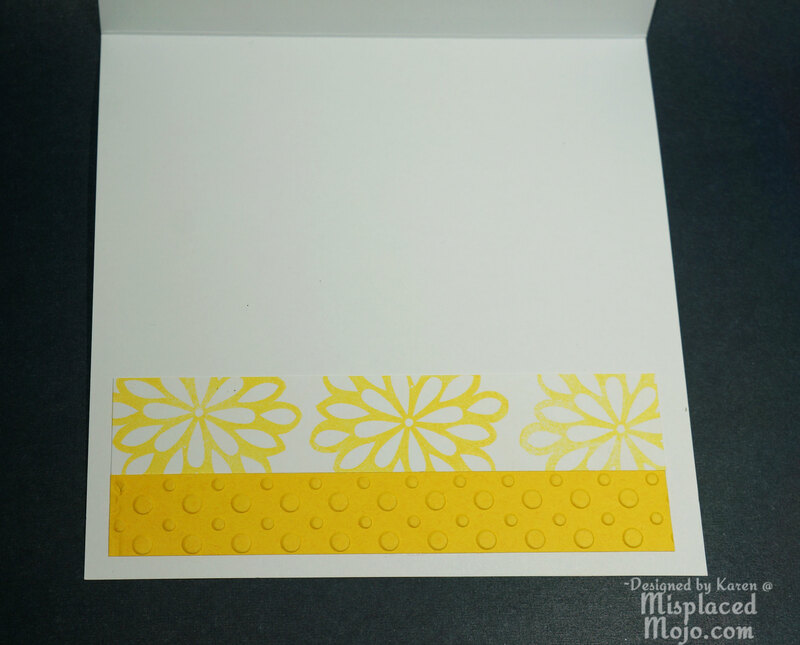 Love your sunny card and all the details (the embellished inside !). Love the various textures too. Thanks for playing along with us at Use Your Stuff ! Love your colorful card Karen! Hope your card brings Spring to you soon…thanks for joining us at Seize the Birthday! HUGS! So pretty and cheerful! 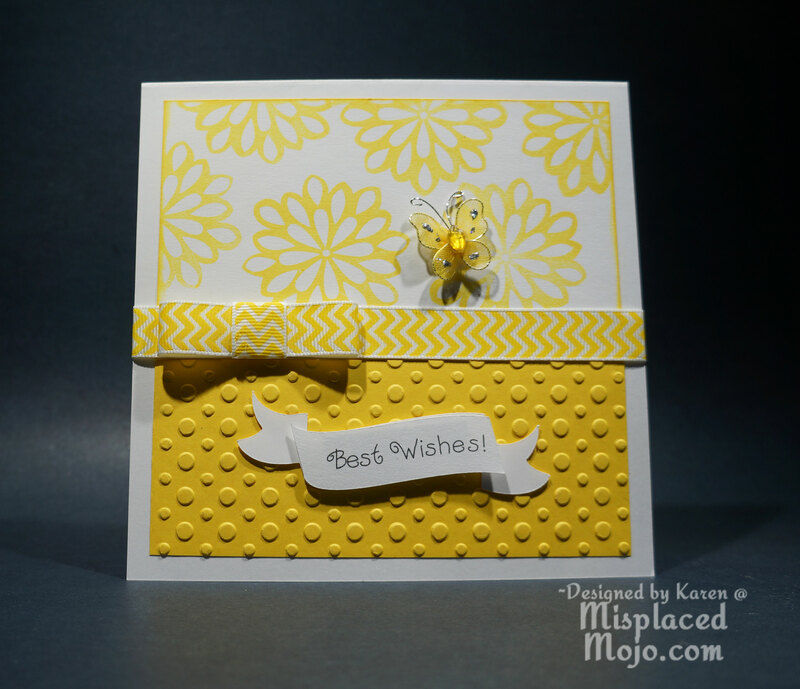 I love the yellow and embossing! Thanks for joining us @ Red Rubber Inspirationals! Very pretty – the bright yellow certainly says Spring! Thanks for playing along with us at Red Rubber Inspirationals! So sunny and bright and perfect for Spring! Thanks so much for joining us at Through the Craft Room Door.